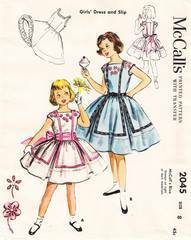 Vintage sewing pattern from 1956 for girls' dress and slip is uncut and factory folds. Dress has full gathered skirt with inverted pleats, square front neckline and back buttoned bodice. Extender shoulders form brief, cap sleeves. Wide sash extending to back bow. Ribbon trim. Optional embroidery for which a transfer is included. Slip has back zipper and underlay eyelet at hem. Girls Size 8; Breast 26; Waist 23.